Colour, change and The Mutants (1972) | Randomwhoness: a Doctor Who blog by Johnny Spandrell. Sampling stories in random order. Doctor Who – now in colour! And how. 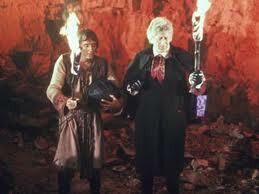 In the early 1970s, the Pertwee years didn’t just move into colour, they dived into it. Suddenly, the future looked garish. Stories like The Claws of Axos and Carnival of Monsters were kaleidoscopes of colour. You literally couldn’t have made a story called The Green Death pre-1970. Colour quickly became fundamental to the series. Similarly multicoloured is The Mutants. Metaphorically in its multi-racial casting and themes of racial segregation. But literally too, particularly in its middle episodes when we spelunk into the radioactive caves of the otherwise grey planet Solos, where blobs of multicoloured light thrash about for supremacy. And in Part Six when rebel leader Ky (the wonderfully named Garrick Hagon) transforms into a beautiful space butterfly. Add to this Tristram Cary’s um, challenging, electronic score of beeps and gurgles and you have a particularly Pertwee attack on the senses. It strikes me that The Mutants is about change, and different reactions to it. The Solonians are changing into grotesque insect creatures and are blaming it on disease. In fact it turns out to be part of an evolutionary life cycle, linked to the planet’s seasons. The imperialist humans are ready to embrace change too, and give Solos its independence. Only the villainous Marshal (Paul Whitson-Jones, giving a bombastic performance) wants to maintain the status quo and keep the Overlords in control of Solos, and even he has a scheme to change Solos’ atmosphere so that it’s breathable for humans. Solos’ quest for independence is a clear allegory for that of 20th century British imperial territories. Many such territories, particularly in Africa, gained their independence in the 1960s, so this was a live and topical issue for Doctor Who to tackle. British foreign policy is something of a theme in Season Nine, with this story and The Curse of Peladon both critiquing how Britain interacted with the world around it. Even The Sea Devils, sandwiched in between these two stories, has Colonel Trenchard, a prison overseer who used to be the governor of a small colony. The bleak future career prospects of people like him and the Marshal are referred to again in The Mutants, when the Administrator (Geoffrey Palmer, doomed never to get out of a Doctor Who story alive), suggests that post-Solos they can find him ‘something clerical’ to do. So the independence stuff seems like a product of its time, and yet even in 2014 we saw the Scottish vote for independence take place. And with a Scot as showrunner (not to mention a Scot as the Doctor), we irregularly get references to Scottish independence. We heard that Scotland wanted their own escape ship in The Beast Below (how did they manage it without a star whale? ), for instance, and weren’t Peter Capaldi’s eyebrows seceding from his face in Deep Breath? So far from being a product of its time, breaking free of colonialism is an ongoing political theme for the program. It’s not that The Mutants was the first political Doctor Who story; we recently randomed The Macra Terror, for example, and noted its fears of totalitarianism. But perhaps The Mutants is the most overtly political story up to that point. It’s clearly criticising imperialism and advocating for leaving other civilisations untouched. The fact that Ky turns into a superbeing and flies about saving the day (and let’s pause here to say hello to The Parting of the Ways, The Last of the Time Lords and Journey’s End) seems to suggest that the better path is to let cultures develop naturally. In effect, to do nothing and let nature take care of business. Before he becomes SuperKy Guy, Ky fills the role of young firebrand nicely. He’s all dark and brooding and dressed in native tribal chic. It’s a wonder he doesn’t fall for Jo, as most young bucks in Who of this era tend to. He’s important enough to get a message from the Time Lords too, although they send it in a very convoluted way. Firstly they send a sort of squared off black soccer ball to the Doctor, and get him to take it to Solos (why didn’t they just send it to Ky?). The black soccer ball will only open for its intended recipient, but the Doctor doesn’t know it’s Ky (why didn’t the Time Lords tell him?). When he does get it to Ky, the soccer ball cracks open to reveal some stone tablets covered in unintelligible scribblings (how did the Time Lords get these? And why didn’t they just write Ky a note?). Ky can’t read them, so he takes them to earthman gone native Professor Sondergaard to be translated (why was the package for Ky and not Sondergaard? And, our old favourite, which professorial chair does Sondergaard hold exactly?). Time Lords, eh? Always doing things the hard way. And striding through all this is the Pert, just beginning the second half of his tenure. By Season Nine, a template is emerging for third Doctor stories. Give him a lab to tinker in to show he’s a scientist. Give him a couple of fights to show his physical prowess. Give him a bureaucrat to belittle and a moral issue to fire up his outrage. Above all, make him looks great; a different coloured jacket each ep, a swooshing cape and frilly shirt. Rings on his fingers and boots on his toes. Patronising and preachy, sure, but a TV series in colour needs a colourful hero and that’s just what the Pert is. And The Mutants is precisely his kind of story. Adventures in subtitling: Stubbsy becomes ‘scolsie’ at one point. The Marshal’s angry cry of ‘Later. Jaegar!’ promotes the scientist to ‘Major Jaegar!’. LINK to The Massacre: Both stories feature Marshals. NEXT TIME: You’re not funny, or clever and you’ve got tiny little legs! Time waits for The Snowmen. Beautifully critiqued! Loving your work here. Thank you! Yes, say it softly, but I’ve never though Colin’s costume was all that stranger than Pertwee’s or Tom’s. And all are pretty outlandish!